The Bankruptcy Abuse Prevention and Consumer Protection Act of 2005 ("BAPCPA"), became substantially effective on October 16, 2005. The remarks by Messrs. Weltman and Moskowitz were highly anticipated and welcomed by the accounting professionals who better understand how tax and planning professionals must comply with the ever-changing and less debtor friendly bankruptcy environment for consumers and businesses. 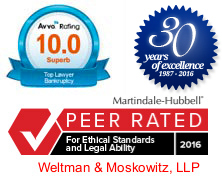 Richard E. Weltman and Michael L. Moskowitz are members of Weltman & Moskowitz, LLP, a business - oriented law firm having offices in New York and New Jersey. The firm handles cases involving bankruptcy and creditor's rights, bankruptcy and business litigation, technology law, real estate, dispute resolution and many types of buy-sell agreements, partner disputes, and transactional matters. They can be reached at 212.684.7800 or 201.794.7500 or by e-mail.